The Sony A-mount Kenko TelePlus MC4 AF 2.0X DGX Teleconverter effectively doubles the focal length of your lens for greater reach. The MC4 features a 4-element, 4-group design with multi-coated lens elements, and fully automatic diaphragm coupling. With the Kenko TelePlus MC4 DGX your prime lens' depth of field is reduced by 1/2, but retains the prime minimum focusing distance. Using a 2x teleconverter with a 300mm lens will effectively increase the focal length to 600mm. A lens set to f/2.8 will now be f/5.6. Box Dimensions (LxWxH) 3.5 x 3.2 x 3.1"
TelePlus MC4 AF 2.0X DGX Teleconverter for Sony A is rated 3.8 out of 5 by 8. Rated 4 out of 5 by Bob from Limited Use, But Not Bad I've just had this teleconverter for a couple of days, and I have used it with my Tamrom 150-600mm, LAEA3 adapter, and Sony a7rii. I took the attached moon shot yesterday, and am pretty happy with the results. The obvious negative is no AF. And of course a tripod is required. In daylight shots, there is heavy vignetting at 1200mm, and the focus is a little soft. I plan to try it with wildlife, but if they're not sitting still, I don't expect too much. It's a nice tool to have in the bag. Rated 4 out of 5 by Anonymous from Great For The Price I use this to get a bigger range out of my 200mm lens (Minolta 80-200mm f2.8 APO) and it works well. Rated 2 out of 5 by Diego from Very soft images. not sharp at all It worked somewhat ok on my A55+Tamron70-200 2.8 I was happy to try it out, but the images turned out not to be sharp at all. I tried handheld at first and it was quite hard to get anything in focus at 400mm. With the tripod it was easier, but the pictures still lacked sharpness. The lens is quite sharp without teleconverter. I ended up returning it because I was disappointed with the results. I would not recommend it. Rated 2 out of 5 by Anonymous from AF does not work properly after 150mm It's really 2x but the statement AF in the product's name is kinda fake. I am not sure if the product is defected or it's just what it is but I'm not happy with this. We tried all the options like CF vs SF etc. I'm using it with Sony Alpha A200 camera and 75-300mm lens. Rated 4 out of 5 by sonny from Practice As with ANY teleconverter,practicing in Manual focus works best. I've tried both the Sony and Minolta 2X converters using focus targets, and can see little difference. Used with 70-200 F 2.8,70-300 G,Sigma 18-300. Will update this review. Rated 4 out of 5 by Armstrong from It works! I always wonder with a new piece of gear about the learning curve. This is pretty straightforward, and was very easy to use. I've had limited time to test it out, but it works fine. It does what it it supposed to do. Rated 5 out of 5 by Randy from Pretty good It works pretty good for me. I've got the light going through an old Minolta 75-300mm, then the Kenko teleconverter, then a fotodiox adapter, into my Nikon J1, and it all works ok, manually focusing. Is compatible with Tamron 150-600 (full frame) and Tamron 16-300 (aps-c)? Is work with sony A-58? 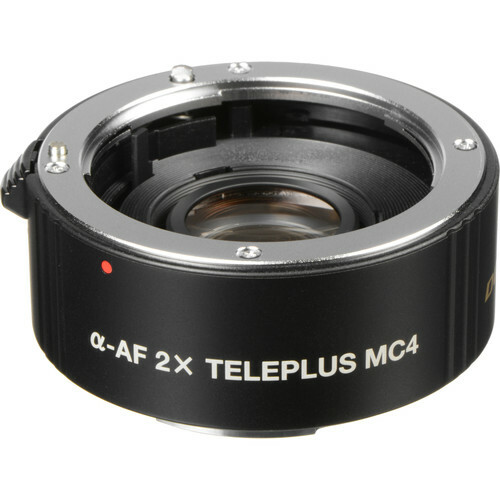 The TelePlus MC4 AF 2X DGX Teleconverter can work with a Tamron 150-600mm with the Sony A mount, but there will not be autofocus. For the Tamron 16-300mm for Sony A, it will not work at all since the minimum focal length is below 70mm. will this work with a sony a7rii and Sony lenses?